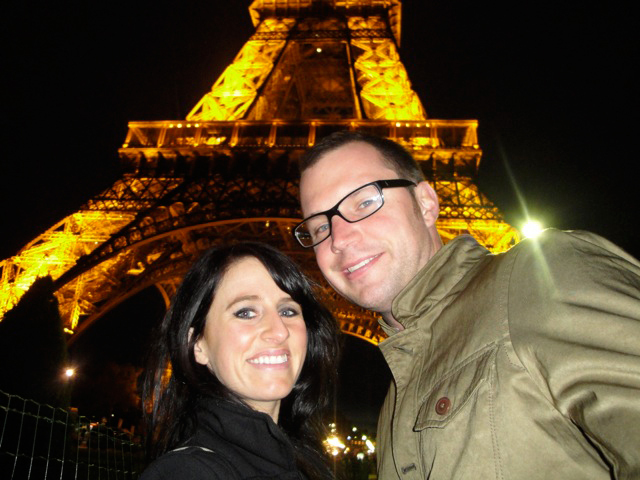 Paris: the City of Lights, French architecture, Tour de Eiffel, and the ever-present French baguette. Who knew such a conglomeration of all things perfect in the world could cost so much? For those big-city dwellers, like New Yorkers, who are accustomed to forking over $15 for a beer, Paris may seem the norm. But for the rest of the world, once you pay to arrive in old Paris and shell out hundreds a night for a small and mediocre hotel room, all you want is a glass of vino or local brew. Is it too much to ask that you shouldn't have to take out a second mortgage to be able to have a meal and a drink? I'm not complaining, because I love this city. 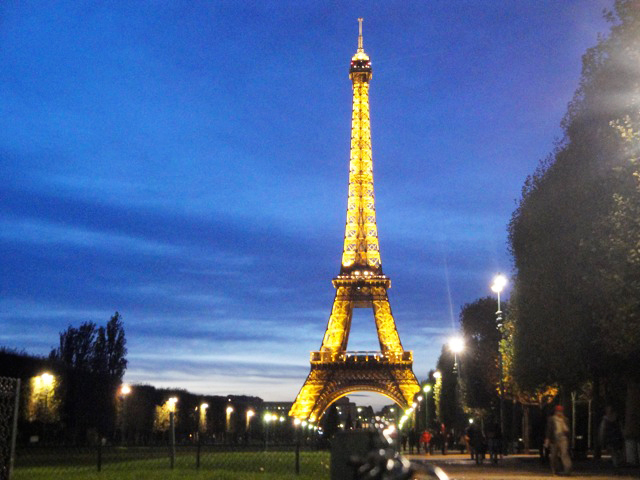 I love its ethereally beautiful buildings, landmarks, endless cafés and brasseries, and the people. Yes, I said the people. Parisians, contrary to popular belief, are actually very nice individuals. They keep to themselves, which is why they may not acknowledge you on the street, but if addressed, they will attempt to communicate with you in a friendly and helpful way. And I love their effortlessly unkempt style. The flyaway dark curly hair, the barely-there chic makeup, and the dark clothing that somehow never seems dull. Yes, J'adore Paris. My husband Nick and I attempted to find ways to lessen the squeeze on our pocket book but still allow us to live it up -- you're supposed to be on vacation after all! And to our surprise, there was plenty to discover in that city that costs nothing or next-to-nothing to enjoy. • From where ever you're staying, take the subway (one of the most thorough and well-connected metro systems in the world) to the Arc de Triomphe. Skip paying to go up inside of the arch (really, who cares? 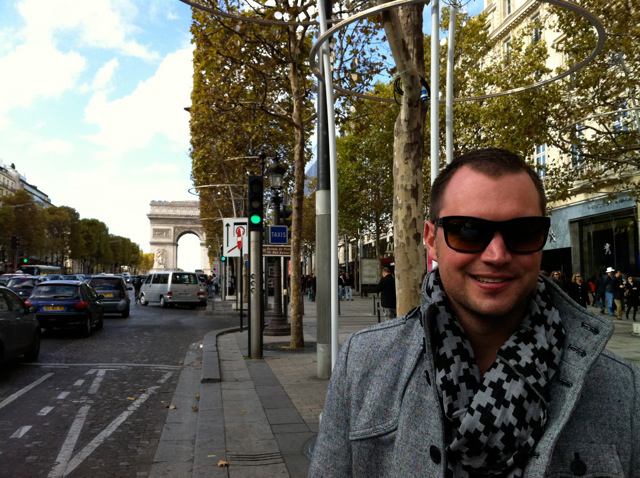 ), and instead, walk from there straight down the Avenue des Champs-Élysées. This beautiful tree-lined boulevard boasts boutiques and shopping galore. So prepare to feast your eyes and leave your wallet in place, as we're on a budget here. But a little window shopping never hurt anyone, did it? I confess I didn't totally stick to the plan as I have a weakness for party dresses and snagged a well-priced one from Zara. ("Oh this old thing? It's nothing, just something I picked up on the Champs-Élysées in Paris"). • Once the concentration of stores decreases, continue walking on past great landmarks: The Grand Palais, catch a glimpse of the gold dome of Hôtel des Invalides (where Napolean is buried), and through the Place de la Concorde -- a fabulous square featuring a fountain, obelisk and neoclassical bulldings. 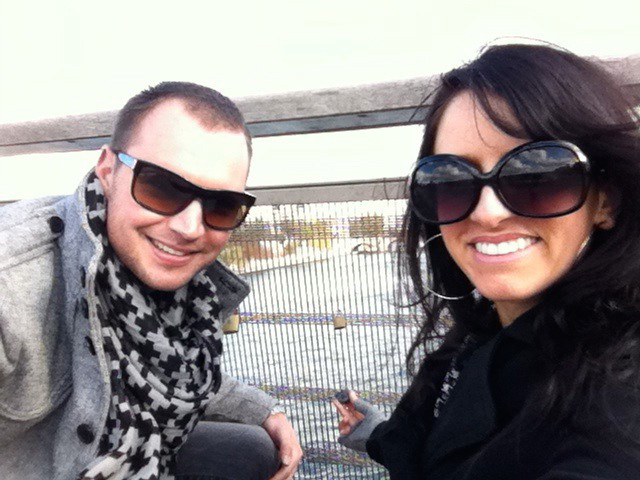 This was also the famed spot where the guillotine claimed the victims of the revolution, including Marie Antoinette. 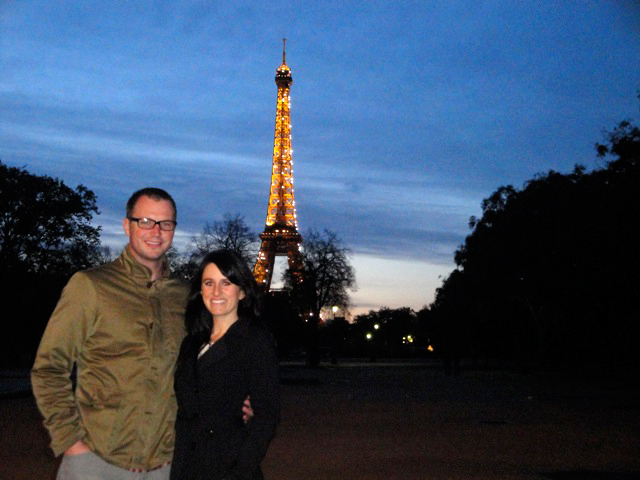 It is a great venue for photos as the Eiffel Tower is clearly visible from here as well. 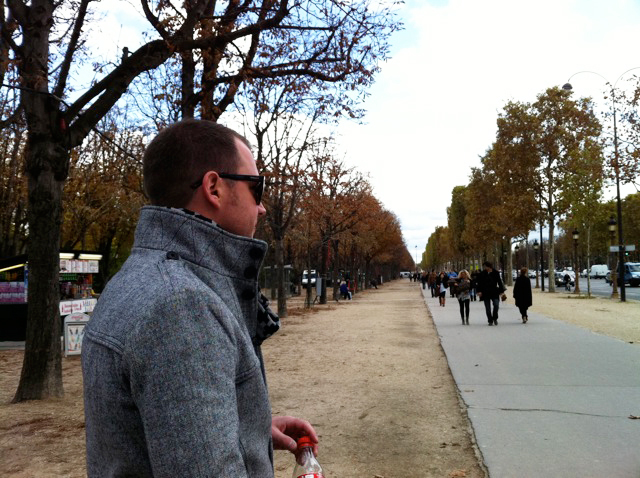 • Continue on, leisurely strolling through the Tuileries Garden and nearly up to the Musée du Louvre. Just on the edge of the garden, near the circular fountain out in front of the Louvre, there are a few park cafés that sell beer, wine, hot sandwiches and desserts. Grab a drink (I chose a delicious hot mulled red wine with cinnamon one day, and the local brew 1664 the next day) and a snack to go (I highly recommend the crêpes nutella!). 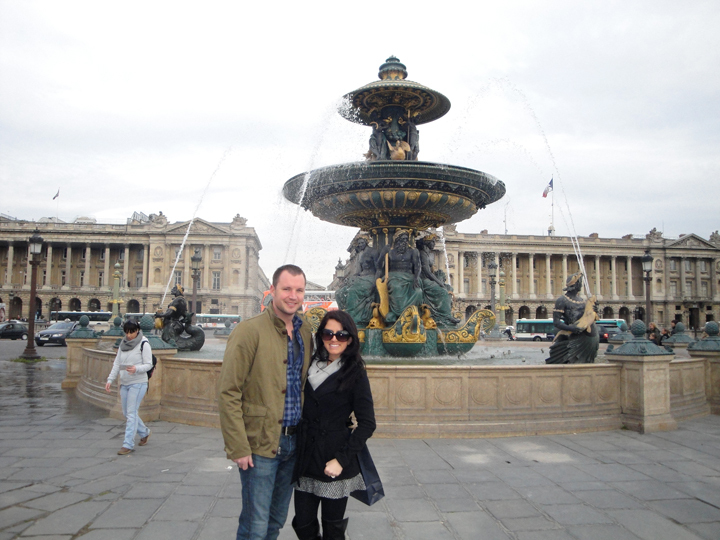 Feel free to plop down in a green chair in front of the fountain facing the Louvre. You might have a few pesky birds approach you, but I challenge anyone to find a more perfect perch for an afternoon snack. 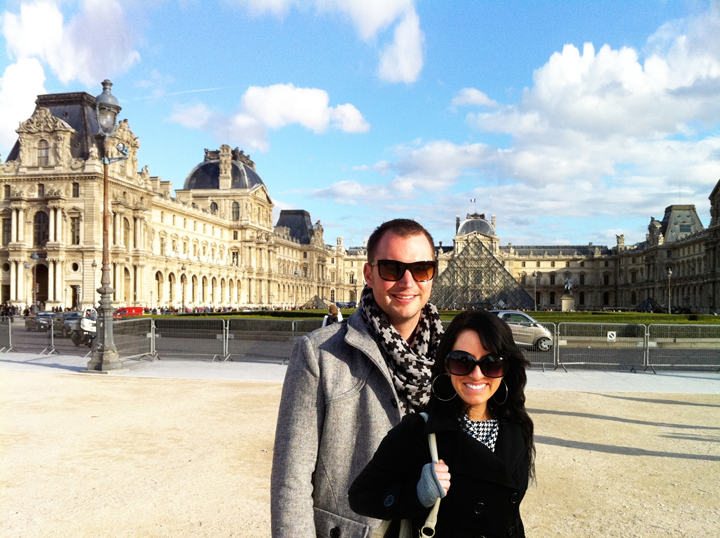 Nick and I partook in this ritual two days in a row, as there's hardly a prettier setting than the Louvre exterior. And another great thing about Paris is, you can walk around with alcohol, so you can purchase a bottle of wine from a store and bring it to any park or bench for your own picnic. You can really save a load of cash by opting for this over sitting in a café every time. • The icon of Paris lives up to its city's nickname with its fabulous illumination and top-of-the-hour sparkling light show. It is truly a thing of beauty; a veritable champagne glass sparkling for the world to enjoy. The show is best seen if you walk down the Champs de Mars (Ecole Militaire metro stop) towards the tower. While many tourists opt to ascend the tower, I consider it somewhat of a waste. While you may be able to obtain some interesting birds' eye snapshots of the city, none of them will include the Eiffel Tower itself. It defeats the purpose in my mind. You can prolong this evening walk by turning right to walk northeast along the Seine and stopping periodically at bridges to obtain different angles of the Eiffel Tower in the distance. • What could be more romantic than leaving your mark on this city? Bring a small padlock and inscribe your names on it with a Sharpie marker (Nick and I remembered to pack this). There are actually two bridges covered in locks: Pont de l'Archevêché, a bridge which crosses from Notre-Dame Cathedral to the Left Bank of the Seine, and the lesser-known Passerelle Léopold-Sédar-Senghor, which links the Tuileries garden to the Musée d'Orsay. 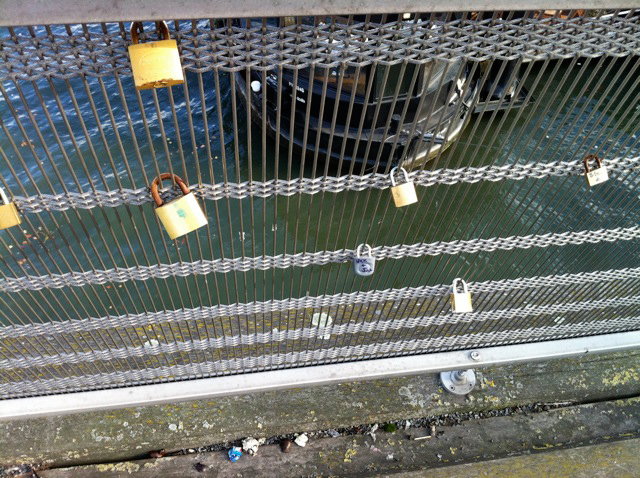 Document your commitment with videos and photos and then chuck the key into the Seine with reckless abandon. It's surprisingly exhilarating and a fun memory to make. To be honest, some French cuisine can be just downright frightening to the average tourist, and even to the culinary-adventurous. You can easily get by with spending 3 EUR for breakfast and 4 EUR at lunch by frequenting the infinite pâtisseries. Our favorite pâtisserie chain is called 'Paul' and there are multiple locations around town. Nick was a fan of the Quiche Lorraine, we both loved the variations of Parisian ham sandwiches, superb Pain au Chocolat, and our favorite item: the Chaud Saucisse. It's essentially a glorified German-style hot dog, but it's divine. It's a soft-yet-crunchy baguette with a sausage, bechamel white sauce and emmenthal cheese, heated to bubbling. It's literally mouth-watering, and Nick and I still crave it. For a French meal that is still on budget, visit a brasserie and order a Croque-Madame or Monsieur with a side of pomme frites, and finish with a decadent crème brûlée to share. • The Galeries LaFayette department store lies in a historic building behind the Paris Opéra Garnier (40 Blvd Haussmann, metro Opéra). Explore the store and take in the finery displayed on each level as you ascend the escalators toward the rooftop. The rooftop terrace will reward you with a beautiful view of the Eiffel tower, the Opera House, and all of Paris -- it's truly a great spot for photos. To continue this vibe but refresh your soul, go below to the cafeteria, where you'll find affordable beer, snacks and even split bottles of Nicolas Feuillatte Champagne (a great quality Champagne at a steal for only 8 EUR!!!). You can grab a seat near a window to stare at the Opera house or the Eiffel Tower. Sipping on bubbly in the comfort of the indoors, gazing out at Paris. I simply couldn't wipe the smile off my face. Viewed 8617 times so far.